“Many people side with the government when foreigners criticise it, believing that, no matter how corrupt the government is, foreigners have no right to make unwarranted remarks about China and its people.” – Zhao Suisheng on Chinese nationalism. Often, criticisms from international observers towards China are interpreted as attempts to “demonise China”. This defensive stance applies not just to present day China and its government, but also to its history. Chinese history textbooks condemn mid-nineteenth century Western powers and Japan as imperialist (帝国主义). Although such criticisms are justified, any suggestion that China’s own territory might have at some point in history been enlarged through imperial expansion will, more often than not, be met with hostility. Meanwhile, the defensiveness of many Chinese with regards to their own history is reflected through their expectations of how Westerners view their’s. 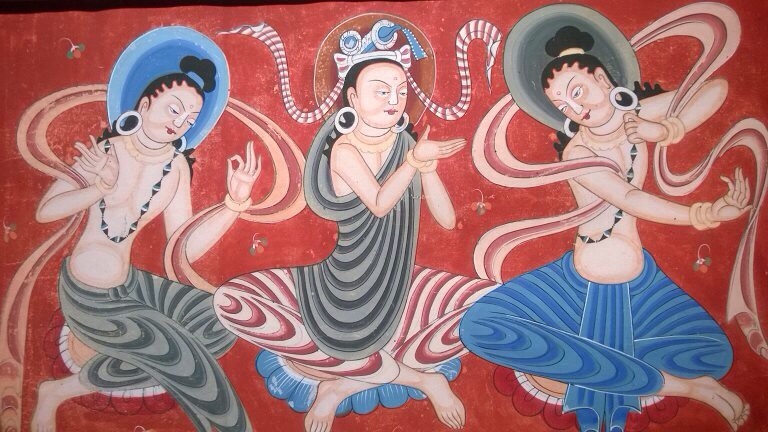 This stance appeared particularly apparent at a recent exhibition of art from Mogao Grottoes. The Mogao Grottoes are a series of hundreds of manmade caves and temples located in China’s western province of Gansu, close to the ancient city of Dunhuang. The site is historically important as it lies on the Silk Road, at a crossroads between between Tibet, Mongolia, Turkestan and central China. As a Chinese frontier town during the Han dynasty Dunhuang became a melting pot of Asian civilisation. 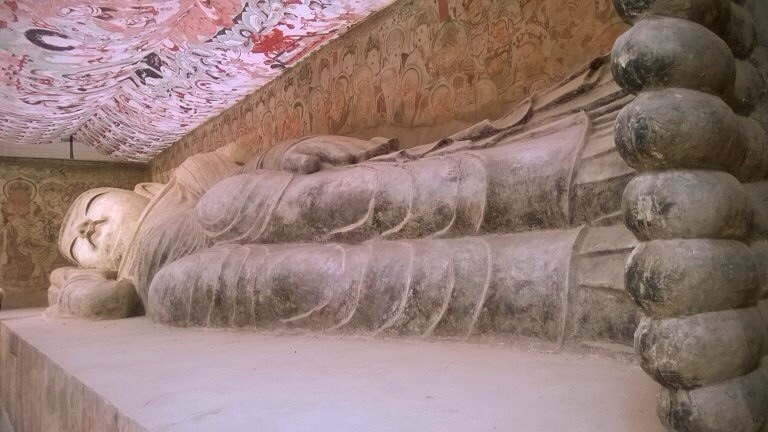 This is reflected in the artistic and architectural styles of the Mogao Grottoes which were elaborately carved and decorated during a one thousand year span from the 4th to 14th centuries. After the decline of the Mongol empire, and of the Silk Road, the site became largely neglected, with many of the caves falling into a state of disrepair and others becoming completely buried in sand. At the turn of the twentieth century there was a renewed interest in the site after Western explorers became aware of its existence. Due to the growing museum and exhibitionary culture in Western Europe it is safe to say that more was known about the site among Europeans than Chinese. Although to talk of the site’s “discovery” would be rather Euro-centric and somewhat insulting to the local population that were well aware of its existence. It was not until after many of the most valuable documents, statues and other works of art were removed by Western explorers that the existence of the Mogao Grottoes was brought to the attention of China’s ruling Qing dynasty. Even then, the chaos brought about by the collapse of the Qing dynasty in 1911, perhaps combined with indifference among Chinese officials, meant that it was not until the 1940s that a research institute was established to look after the site. 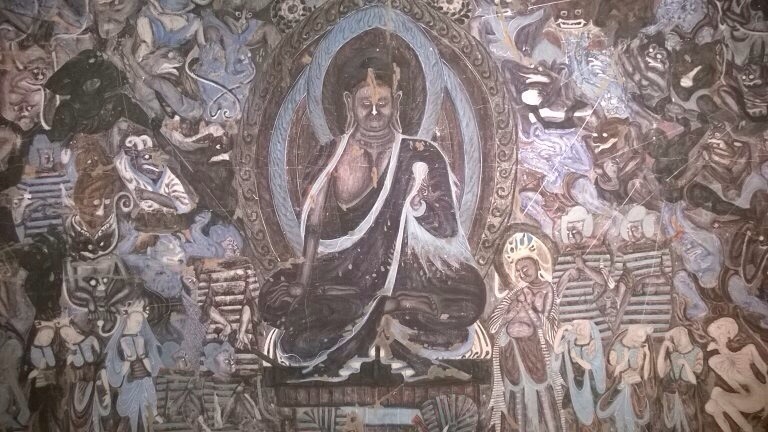 The sites murals were restored and protected whilst copies were made; the copies becoming part of an exhibition publicising the Mogao grottoes throughout China. In 2014 Zhengjiang Art Museum in Hangzhou, hosted an exhibition of the copies of the Mogao murals with reconstructions of several caves. The main exhibition halls were visually impressive but there was less to attract visitors to a smaller hall on the second floor. From a historical perspective, however, this area was no less significant. The exhibition hall in question simply featured information boards narrating the history of the Mogao Grottoes after their existence was brought to the attention of Chinese and Western explorers in the early 20th century. Shortly after entering the exhibition hall I was surprised to hear a woman, with a certain level of resentment in her voice, informing her young son that foreigners are always attacking China and stealing things from China, and that the Mogao Grottoes belong to China. I was surprised to hear such resentment because, having skimmed through the English language information boards, there seemed to be very little that would incite such an attitude. In fact, descriptions of non-Chinese exporters seemed in many ways to be cast in a positive light. By contrast the Chinese translation simply states that pillion was an expert on china (中国通) and that he copied inscriptions and took photographs (抄录题记并拍摄). Unlike the English translation the Chinese has an explicitly condemnatory tone, claiming that Pellion cheated the monks out of the cream of the crop by purchasing paintings and manuscripts at an unreasonably low price (选取精华，廉价骗购). As with Pellion, Stein’s acquisition of precious articles from the Mogao grottoes is far more condemnatory in Chinese. Whilst the English states that he “paid the incredible price of £130”, the Chinese claims he “used the ignorance of the Taoist monk Wang to cheat him and pay an unreasonably low price” (利用王道士的无知，廉价骗购). Given the grammatical errors present in the English it is clear the author is Chinese. The question, therefore, is why a Chinese translator would go out of their way to reduce the accusatory tone and present the foreign explorers in a more positive light. It was evident from their reactions that the students thought this was a taboo topic to raise with a British person. They then expressed shock that I was not only unoffended, but that I also quite happily participated in condemning the actions of the British government 150 years ago. The fact the students thought I would be offended at justified criticism of 19th century Britain seemed indicative of how the average Chinese student would be offended at criticism of China at any stage in its history, no matter how justified that criticism might be. It was perhaps this very same mind-set that influenced the author of the information boards on display at the Mogao Grottoes exhibition. Assuming “foreigners” are as sensitive to their own countries histories as the average Chinese student was quite likely a factor behind the translation discrepancies, and is almost certainly a product of China’s patriotic education system.